Screen Protector - 13.3" x 10.7"
All Products → Screen Protector - 14.44" x 9"
The screen protector protects your screen from scratches, dust, sand, grit, moisture, fingerprints and other contaminants. It is easy to install, won't damage your screen, can be removed without damage. (14.44 inches x 9 inches). 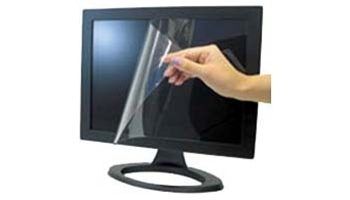 The screen protector is a high-quality silicone sheet that fits on your flat screen or laptop monitor to protect it from moisture, scratches, and other contaminants. The screen does not interfere with the screen visibility. The screen does not use adhesive strips so no area of the viewing screen is lost. If desired, screens may be cut into smaller pieces to provide screen protection for cell phones, game machines, watches, and any type of screen that needs protecting. Continue smoothing out the screen until all of the air bubbles are removed.